Stainless seel and white gold case with a stainless steel and white gold bracelet. Fluted 18k white gold bezel. Blue dial with hands hands and stick hour markers. Minute markers around the outer rim. Luminescent rolex logo appears at the 12 o'clock position. Date display at the 3 o'clock position. Self winding movement. Scratch resistant sapphire crystal. Case diameter: 41 mm. Water resistant at 100 meters / 330 feet. Functions: hours/ minutes/ seconds/ date. 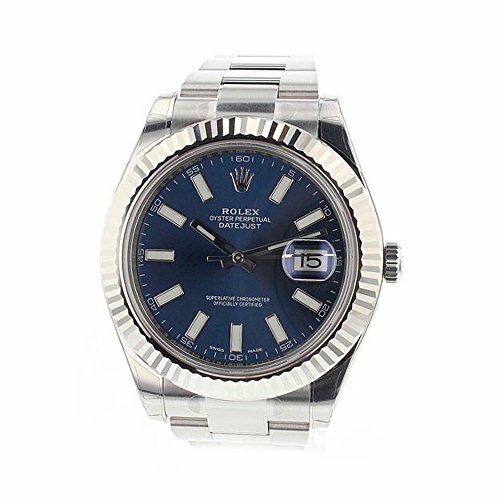 Rolex Datejust II Blue Index Dial Fluted 18k White Gold Bezel Oyster Bracelet Men's Watch.